While small solar panels are a convenient way of getting power on-the-go, and you can certainly buy them off-the-shelf at an unfair price, a little understanding of their practical setup can go a long way. This DIY solar panel guide will show you how to properly configure your own for a fraction of the cost. Solar panels are photovoltaic, and generate a voltage when exposed to light. The specifics of their construction are perhaps interesting. Like thermoelectric elements, they consist of two different materials which can generate a current. One layer of silicon is infused with a material that gives it an abundance of electrons, and another layer is made deficient in electrons. These materials, N- and P-type, respectively, form our negative and positive, and between them, a useful current can flow. The electrons do indeed flow from the negative to the positive material. When first learning this, it can be a fair bit puzzling. In the old days, when both bona fide scientists and electric philosophers (you too may call yourself an electric philosopher if you wish 😉 ) were discovering the what’s what of electricity, some misunderstandings led them to see the negative as the positive, and the positive as the negative. But truly, in the practical sense, it just doesn’t matter. 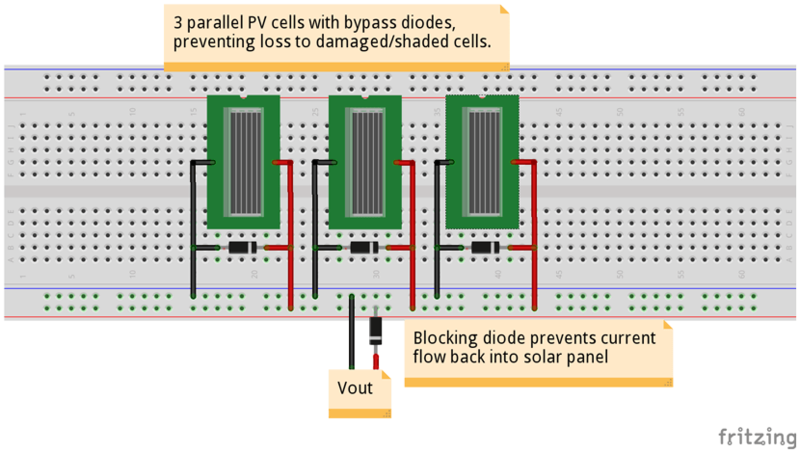 Should I connect my solar cells in series or in parallel? It depends. What output voltage do you need? The effect in watts is the same. The 12V lead-acid battery charger uses a step-down converter set to output 14.67V, and is rated for ~90% efficiency. Given 10W on input, it outputs 9W. Step-down converters are generally thought to be the most effective way of regulating voltage in terms of efficiency. But on the matter of which type of setup you should use, it is best to first test your panel outside. Set your multimeter to measure DC voltage, and attach the leads to the output terminals of a single solar cell in normal daylight, around noon. It doesn’t have to be extremely sunny or anything, just “normal”. Make sure you keep your panel perpendicular to the sun, and write down the voltage you read from your multimeter. With my puny 6V cells, I read ~5V per cell with the sunlight slightly diffused by a thin shifting cloud cover. I have 6 of these cells, and can expect at least 30V in normal daylight, and about 36V when it’s sunny, sometimes more. Since I want to be sure I always have a high enough voltage to step down to 14.67V I wire mine in series for ~30V on average, and accept the 10% loss on my step-down converter. The next step is to ensure that each cell in the panel performs well, and absolutely that any battery I am charging does not discharge into the solar panel. (Note: any flow-back would probably be blocked by either a converter or regulator, but that’s not the point here). In order to do this, I add a blocking diode, and accept a voltage drop of somewhere around 0.4-0.7V. I also make sure the blocking diode can handle the maximum current my panel can output, ~1A, by using a diode rated for at least 2A. The anode of the diode is connected to the positive terminal of the solar panel, and the cathode (usually marked with a small white ring) is connected to positive input of my charger circuit. 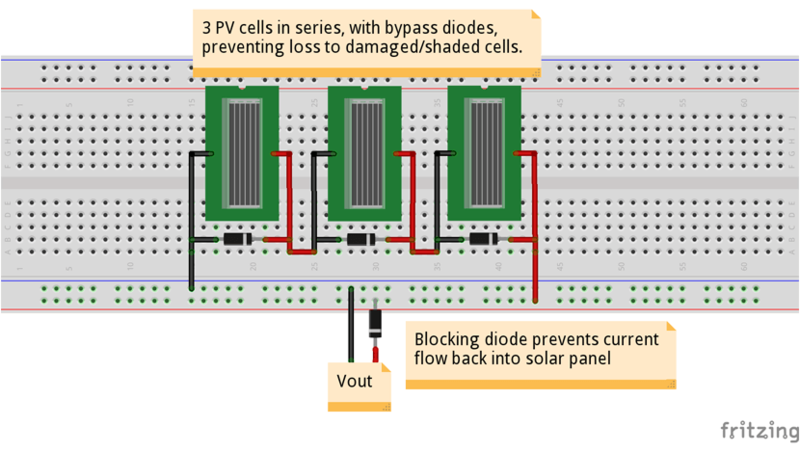 This wiring is called forward bias, and simply means that ideally no current flows into the solar panel. 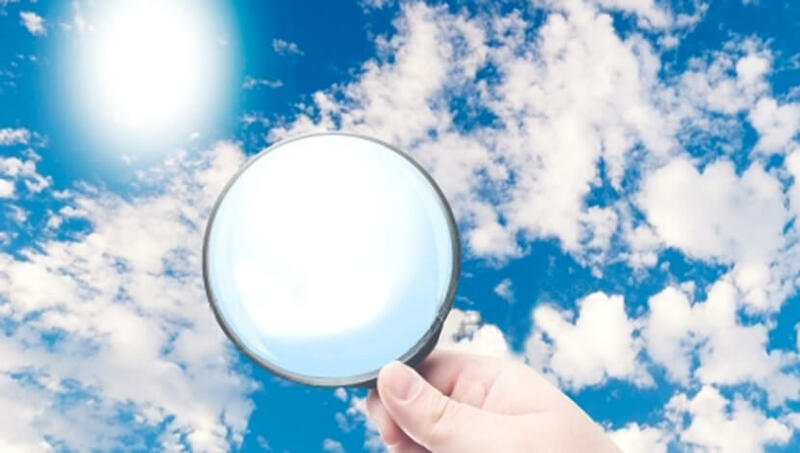 In practice, there’s always a little leakage, but it is barely measurable. To level the output of all the cells out, I also add bypass diodes to prevent one with a high output from leaking into others which either draw power because they are in the shade (for whatever reason), or have developed some fault. Many low-end commercial panels do not use these bypass diodes, or only use them for each set of cells – they do improve the output considerably, and should always be in place. Simply connect the anode to the negative terminal, and the cathode to the positive terminal – do this for every single cell. This is called wiring diodes with reverse bias, and prevents the flow of precious current into damaged/shaded cells. The argument that “doing this for every cell is too expensive” is often heard – it’s just not true. Micromechtronic offers a great variety of diodes at low prices and you will never experience a single faulty cell taking down your entire panel. Let’s have a look at two different circuits. The first is a set of three solar cells wired in series, and the second is a set of three cells wired in parallel. All have bypass diodes, and on the output, there is a blocking diode. In series, the voltage output of each cell is added to the output of every other cell. The current remains the same. If these three cells were 6V each, and had a current output of ~0.3A each, the output from the circuit would be 18V at 0.3A, or 5.4W. It’s simpler to describe in watts, as you’ll see below. In parallel, the voltage output is the same (or rather, an average of all the cells combined), so: 6V. The current output is multiplied by the number of cells, however, so here we can expect to see 6V at 0.9A. Or 5.4W total – again. Whichever wiring you choose, even if you mix it up, it all depends on what best suits your needs. The bypass diodes you use should be able to handle double the current you expect, as a rule – the same applies to the blocking diode on Vout – but other than that, you’re the boss. At the output of the solar panel, you can start having fun. While step-down converters are nice and effective, they do not have as glorious a feature as ‘thermal shutdown for your protection’. An LM317 or LM350 (which can pass 3A) doesn’t fail on you, like the children of the new millennium expect things to fail. It just takes a nap, so you can reconsider how your calculations are working out for you. Step-down converters are less rugged, but certainly more efficient, and less lossy. If you don’t need rugged, and can readily replace a broken converter, by all means, use one. If you need a resilient circuit, try a linear voltage regulator. If you are charging batteries, at least place a fuse in-line that is slightly above C/1, e.g. for a 12V 9Ah lead-acid battery, C/1 is 9A, so you would use a 10A fuse for that. Why? A dead battery can present itself to the source of charge, in this case a solar panel, as a dead short. It’s not even funny, that’s how bad that is. I was real gung-ho “I don’t need no stinking fuses” with an 850W PSU I modified last year, until I burned my hands badly shorting a few wires accidentally… Now I love fuses and current limiters, and so should you. You don’t have to be an idiot to burn your hands like I did, but it helps. Li-Ion/Li-Po/Li-Cobalt/etc batteries require additional protection circuitry. Don’t mess with that until you’ve read up on it – check out http://batteryuniversity.com/learn/article/charging_lithium_ion_batteries. All that talk isn’t meant to scare you, of course. Fear of injury is worse than the harm itself, from a philosophical perspective. If you need to store the energy from your solar panel for the evening- and nighttime, have a look at our 12V DIY charger article. It’s scalable to charge several 12V lead-acid batteries in tandem, with only some easy modifications, and it will NOT cost even a fraction of a Tesla Powerwall. Li-Ion/Li-Po/Li-Cobalt batteries are a bit trickier to charge than lead-acid, and only make sense if you have to smack them into something compact that you carry around – regardless… nothing says RAW POWER like a rack of 720Wh batteries in your garage… after all, a family will on average consume between 20 to 40kWh per day, and most in the evening when the sun has dropped from the sky. Now that you know how to wire it up in an effective manner, you only need to pay attention to the panel’s angle to the sun. It is most effective when exactly perpendicular (the sun at 90º). If it is overcast for a longer period of time, instead use the diffused light of the sun and simply lay it down facing the heavenly dome, so it sees as much sky as possible, and nothing else. On an overcast day, the sunlight is diffused into the cloud cover, so to harvest it, it makes little sense to point a panel at the sun. Instead point it at the clouds which are absorbing some of it, but still bouncing much of it down to your panel. Absolutely inspiring feature for homeowners looking for DIY. Please contact us during business hours. Inquiries made after hours will be responded to within 24 hours.